It’s early in the morning and I am sitting here typing one-handed with a baby in my other arm. I think this is how life is going to be for the next little while! But that’s OK with me. 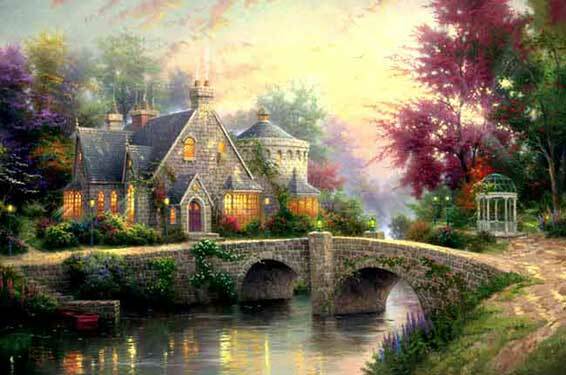 I just found out that the “painter of light,” Thomas Kinkade, has passed away at 54. [See here for a great article on the subject, as well as here.] Kinkade has been the default example of bad “Christian” art since at least Frank Burch Brown’s Good Taste, Bad Taste and Christian Taste (though Burch Brown also has some choice words for Precious Moments figurines). Though undeniably technically skilled – and according to this article, a fan of Robert Rauschenberg and Franz Kline – critics from all sides (including theologians of art) have consistently found his work to lack something even more important: taste. Who was it that defined sentimentality as having more affection for something than God does? To be sentimental – seen as a negative tendency, in our culture – is to supersaturate things with feeling. (Just watch TLC’s “My Crazy Obsession” for examples of how such excessive “investing” of emotion in material objects can apply to things as diverse as Cabbage Patch Kids, carrots and Mickey Mouse memorabilia.) 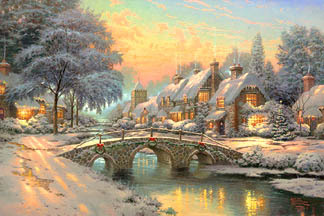 However, in Kinkade’s case it sounds like his nostalgic, sentimental art – the snow-covered cabins glowing and glistening – was driven less by a love of all things bright and beautiful and more by a realization that he could make a very large amount of money by painting such treacly subject matter. That’s one way of looking at it. The other might be to see Kinkade as a courageous artist, going against the grain and doing what he wanted regardless of the art world and its fickle trends. Should artists pay attention to the “critics”? Do they help steer art and artists in the right direction over time, sifting the truly great from the ephemeral, or does critical discourse simply exclude divergent voices from mainstream acceptance? It’s a pressing question… who decides what is “good” art? If you subscribe to Arthur Danto’s institutional view, it is precisely critics, curators and the “artworld” who determine what’s in and what’s out. But if you go by mass appeal, Kinkade might be a more successful artist than most artists working in New York and London today. An open question, to be sure. But the real question is: who are theologians and art critics going to use now as a case study of bad religious art?